Whatever you may think of the U.S. President, Donald Trump – he makes an impression. This week I’m going to share some markings and how they interact. Next week, I’m going to talk about Mr. Trump’s emotional, thinking and energy output styles. The markings in red are challenge markings called “heart lessons.” Heart lesson markings indicate some sort of “power give-away.” Power give-aways lead to intimacy issues. They become a barrier to receiving love and acceptance. *Jupiter Star (under the index finger): This gift marking indicates leadership potential. However, the shadow of this gift can be power struggles, hiding from power or misusing power, such as bullying. The challenge is to find an “appropriate” throne. A person can be in a leadership role but be leading the incorrect realm. Is the U.S. President in the correct realm? Some would say “yes,” some would say “no.” It depends on whether or not he is leading in favor or against your values and beliefs. * Apollo Star (under the ring finger): This gift marking indicates “fame and fortune in the arts” or a life living in the spotlight. Mr. Trump has certainly spent most of his adult life in the public eye. The shadow of this gift is hiding out, visibility issues, or fearing rejection. If a person is visible, they may still be very sensitive to criticism and take it personally. In Mr. Trump’s case, if he feels rejected or slighted, his Jupiter Star could start to defend his Apollo Star, creating quite a lot of drama and power struggles. 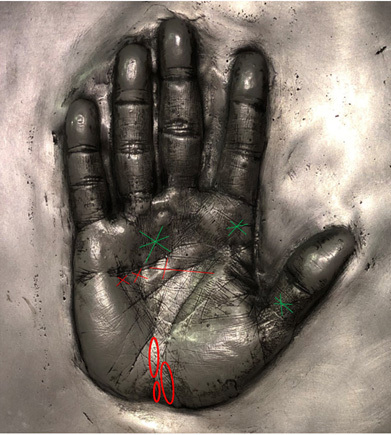 * Seer Star (on the middle of the thumb): This gift marking indicates visionary ability. Donald’s mind can gaze into the future. It can sometimes be predictive but it also sees what others miss or opportunities others can’t imagine. He is a visionary who can see around the bend. The shadow of this gift is not seeing the forest for the trees. It can be proverbial or literal blindness to what is happening in your immediate environment. You can get so caught up with “castles in the air” that you miss the reality under your nose. All of the above markings are gifts. When used properly, powerful things can unfold. Used improperly or not at all, pain and chaos can ensue. Mr. Trump is a leader (Jupiter Star) in the spotlight (Apollo Star) who has seen many opportunities others have missed (Seer Star). He can also be a bully, sensitive to rejection and grandiose and unrealistic in his visions. Bitter Pill (3 shown): This heart lesson marking is very common. What is not so common is to have three of them! A bitter pill is hard to swallow because it’s big and tastes awful. The shape of the marking also appears like a pill. When you have a bitter pill in your palms, you experienced high expectations in your childhood to live out the life movie of one or both of your parents or guardians. For example, if your parents wanted you to be a lawyer, you felt pressure to become a lawyer and might even become a lawyer. Mr. Trump followed in his father’s footsteps in real estate. After his beloved brother died from alcoholism, Mr. Trump reportedly felt pressure to live up to his father’s expectations and take his brother’s place as the golden child. This pressure can create emotional bitterness, grief and frustration. If you have this marking, it’s important to take a step back from your life and ask yourself if you are truly living out your own movie or what you think will make your parents proud (whether they are dead or alive). Mr. Trump may be driven on some level to prove to his father he is worthy of his father’s love – even though his father is deceased. This pressure to achieve can blind a person to the people around them and has the potential for workaholism, relentless ambition and a feeling that no matter what one achieves, it’s never enough – so new goals must be set and won. Dangling X’s off the heart line: The dangling X is just that – an X formation dangling off the heart line. The heart line represents our deepest relationships – with self, peers, lovers and family. It holds the secrets of love, hate, forgiveness and commitment in our lives. The heart reveals the emotional contracts we make – whether spoken or unconscious. A dangling X indicates feeling unsupported and betrayed by those closest to us. Sometimes the owner of the dangling X does the betraying – either in response to betrayal or to blunt one’s self from the discomfort of intimacy. Other times, the betrayal is imagined, leading to jealousy and insecurities. How do you allow others to help you, love you and see you for who you truly are? We often feel betrayed or are accused of betrayal when we don’t reveal our true feelings until it’s too late to salvage the relationship. The bitter pill could also indicate a sense of betrayal. The owner of the bitter pill may have not been adequately seen or acknowledged by their parents – a betrayal of acknowledgment. Two or more of the 21 possible heart lesson markings can overtake your life and diminish your Life Purpose potential if you aren’t aware of them. Mr. Trump could spend a lifetime trying to prove his worth and fighting off perceived threats/betrayals if he is not conscious these dynamics are at play. On the master path, the current U.S. President has an opportunity to use his tremendous gifts of leadership, visibility and vision to guide the country he leads to a greater achievement and progress. However, if he is still in a battle with his father to prove his worth and fears betrayal lurking in dark corners, it could make him paranoid and obsessive, drawing his energy away from progress and into a private battle with his own soul.